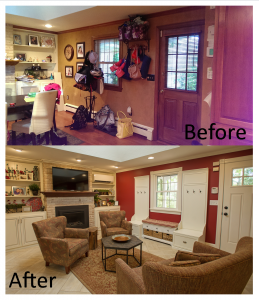 One of Red Couch Interiors favorite stages in the design process is looking at before and after pictures of a completed job. The Classic Kitchen Expansion project is no exception. This first floor remodel included a custom kitchen with an expansive island, adjacent sitting area with a fireplace, enlarged dining room and an inviting foyer. Once the contractor was selected, the determination was made that the wall between the kitchen and dining room was a supporting wall. Therefore, a load bearing beam was required to be installed if the client wanted the open concept floor plan they desired. The selection process was fun. 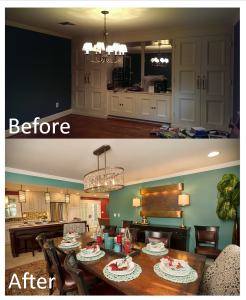 The homeowners wanted a classic look with bold accents, including bright wall colors in the dining room and kitchen, textured accents, like the basket weave backsplash in the kitchen, a dynamic water feature in the dining room, and eye catching lighting fixtures throughout. The concept was perfectly designed for their wants and needs. Once the project officially went under way and the wall was removed, it immediately looked like a new space. One by one sub-contractors completed their tasks with precision. Before we knew it, the large format, herringbone floor tile was being installed and the walls were being primed and painted. 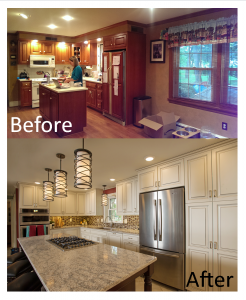 The most dramatic finished product were the kitchen cabinets. Gorgeous white cabinets with a glaze scanned the perimeter with a dark cherry island making a statement in the middle. Stunning. The craftsmanship and artistry were apparent. 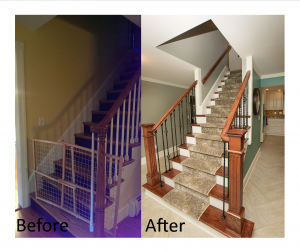 Lastly, the new staircase with wrought iron spools were installed. Twelve weeks later, the area rugs and furniture were delivered consecutively, pulling the entire space together. RCI decorated with finishing touches making the house feel like a home again. We hope you enjoyed this process as much as we did. See the entire portfolio here. Call us to start your next project today!